It has been too long since my last post, but I have been super-sonic focused! I had to re-examine a few things in my life over the last month and have been crazy-busy making life happen! I gave a keynote at the South Dakota Marketplace conference, Creative Confidence: Leading Yourself and Your Business, and it felt great! It was the keynote I had playing in my head for years, and the MarketPlace conference was the perfect venue in which to launch it! I also taught a workshop, The Visual Vision: Grow Your Bottom Line & Your Life, during the last afternoon of the conference. Great energy filled the room!!! People all left with a vision of where they want to go and what they want to experience. There were a number of great breakthroughs. One woman finally identified the concept for her children’s book, which she had been working on for quite awhile. Another young man (who struggled with drawing at the beginning) came up with the vision for his welding company. There were so many great discoveries in this class. Cool things always happen when you blend Super-Sonic Focus Time with scented markers, crayons, and fun! Thanks to everyone who worked hard to make the conference a success. A very BIG THANK YOU to my good friend and founder of eVentures Marketing, Shawnna Silvius, for hooking me up with the folks in South Dakota. After returning from the great state of South Dakota, I turned in a grant pre-proposal for a web-based talk show, had a job interview, and turned in my final book manuscript!! My first book, Go Wild with Confidence!, should be available soon!! Whoo Hoo…it was a busy October! I also attended my cousin’s wedding and had some Halloween fun with my family. A great month and a great life! 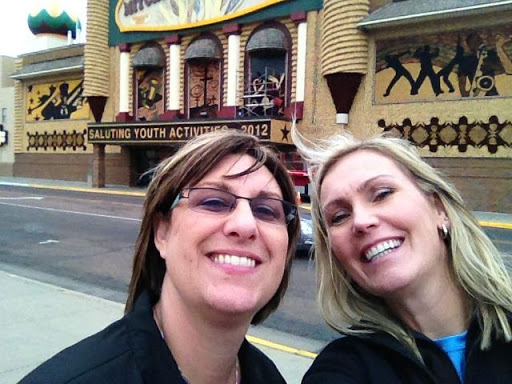 Shawnna and I at the world’s only corn palace. It’s a must-see in Mitchell, South Dakota! ← Book Panel A Success!